Haven’t been in Madrid yet, but planning to visit it? The best way to get anywhere in Madrid’s downtown is to walk. Madrid streets and buildings are witnesses of exciting stories of all kind and time. Ready for walking tours in Madrid? This post has many things you need to know to make your first visit to Madrid an unforgettable experience! Where can I go on a walking tour in Madrid? All 21 districts and 124 neighbourhoods of Madrid show a different personality. In addition, you will appreciate that Madrid has 3 advantages over London, Paris or Rome: its cleaner, has less stress and more beautiful public parks and gardens. Walking tours in Madrid bring you to the Royal Palace; you should know that in such illustrious spot was signed Spain’s accession to the European Union and the Peace Agreement between Egypt and Israel. On May 2, 1808, at the Puerta del Sol, the people of Madrid revolted against Napoleon’s invading army. Around 3.000 Madrilenos were killed. You can have a vivid picture of that dramatic event watching at the Prado Museum Goya’s dramatic masterpiece ‘’La Revuelta de los Mamelucos’’. Madrid is a cosmopolitan city of 4 million inhabitants which hosted 12 million tourists in 2017. Well fitted tourist offices in downtown provide a complete information to tourists. Said in few words, Madrid is a kaleidoscope of exciting stories waiting to be discovered by travellers. 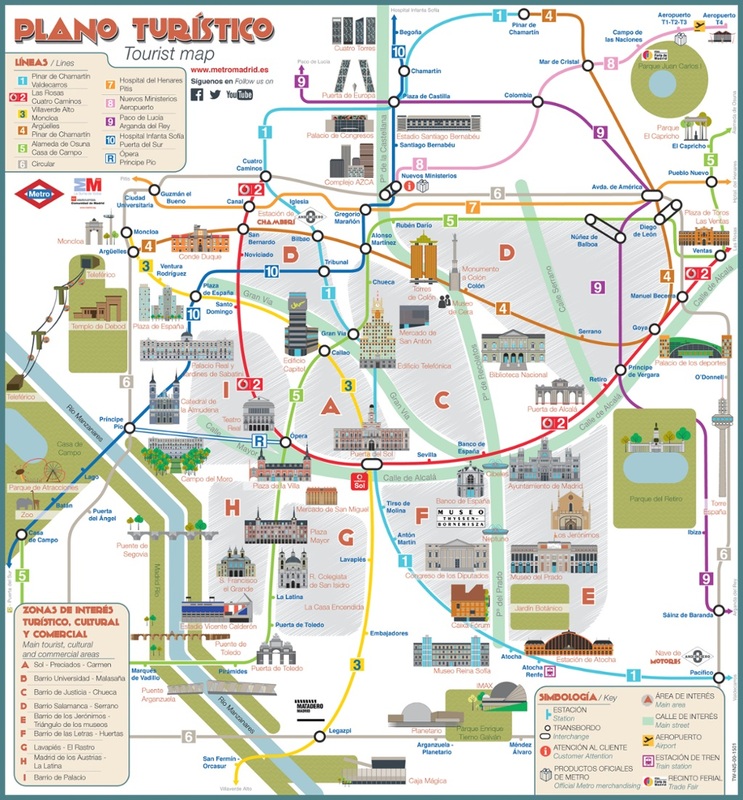 You may want to do walking tours in Madrid using a Tourist Map of the city. 4 Which are some of the many gardens you can enjoy during the walking tours in Madrid? The endearing Plaza de la Villa in Madrid together with neo mudejar/gothic Palace of Lujanes and baroque old Townhall, catch the eye of all Madrid visitors. Maybe the most popular between the walking tours in Madrid. On the wall of Lujanes Palace there is a plaque commemorating King Henry IV who conferred Madrid its title of Noble and Loyal Villa. Next to it, another plaque, of very ironic significance, points out that the former Palace of Lujanes noble family is now the current office of the Royal Academy of ‘’Moral and Political Sciences’’. Right next to these plaques is the oldest Moorish gate of Madrid, which was later integrated into the building of the Palace. From this point, turning behind, you will discover a beautiful arch that connects the old Townhall with the palace house of a nephew of Cardinal Cisneros, built in plateresque – renaissance style. Cardinal Cisneros, uncle of the owner of this palace, was a preeminent leader of Catholic religion who also distinguished himself for having founded the second oldest university of Spain in Alcalá de Henares and for having supervised the education of an orphan boy, who at the age of 16, was crowned Emperor Charles V.
After a 5-minute start any of your walking tours in Madrid you will arrive at the Plaza de la Paja where, in the 13th century, was held on Thursdays the ‘Mercado de la Villa de Madrid’. Nearby is the Plaza de los Carros, which was parking lot and trough for carriages and horses on Market Day. In this plaza was the Palace of the family Lasso de Castilla, where the founding kings of Spain, Isabel and Fernando, were lodged every time they visited Madrid. Supposing you are interested to learn the countless stories of medieval Madrid, like why the Umayyad Moors founded this city, tour the many ancient caves of Madrid, King Ramiro II’s motives for ravaging Madrid, what happened in Madrid to the unfortunate Mancebos, how does the city of Madrid honors Beatriz Galindo, la Latina, and her husband Francisco Ramírez, where are located the 2 oldest churches of the city, in which cunning way King Alfonso VI reconquered Madrid, what was before on the streets Mediodía Grande and Mediodía Chica, and so many other things, you only have to sign up for our mysterious private tour the Secrets of Madrid. Don’t think you know Madrid well without having first walked through the Madrid of the Austrians. In case, you choose Walking tours in Madrid about The Austrians were a royal dynasty from Austria and Hungary. The first Austrian in Spain was Felipe I of Castilla, married to Juana, the eldest daughter of the Catholic Kings, Isabel and Fernando. Their reign in Spain spanned from 1516 to 1700 and during the first two Austrian Kings Carlos I and Felipe II, the Spanish Empire was the most powerful in the world. It was Felipe II who in 1561 appointed Madrid ‘Villa y Corte’ (Capital) of Spain. Between 1995 and 2002 the Madrid of the Austrians got completely restored thanks funds provided mainly by the European Union. Its old houses were fully renovated, new bathrooms, electricity, water and gas conductions, trees were planted and the streets got better paved. To walk in the intimate labyrinth of narrow streets and multicoloured houses of the Old Town of the Madrid of the Austrians is one of the greatest pleasures you can have in Madrid. – El Puente de Segovia: Finished in 1584 by Juan de Herrera, the architect of the Escorial. 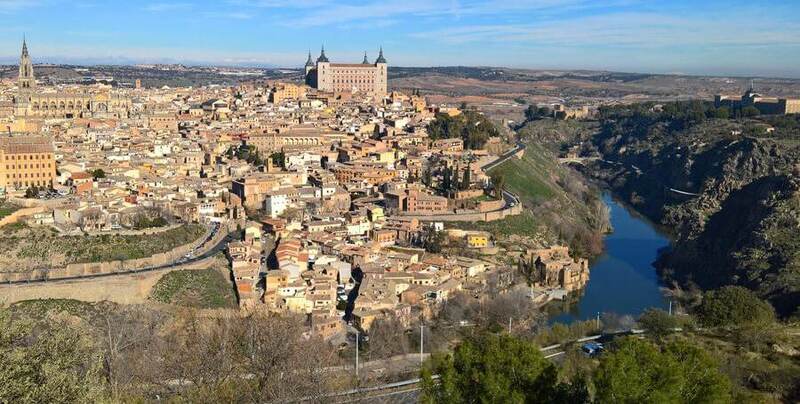 From here you will enjoy an awesome view to the Casa de Campo, the largest park of Madrid. – Las Descalzas and Encarnación Royal Monasteries, inhabited by the Poor Clare Franciscan sisters and Carmelite Augustinian nuns respectively, who maintain in XXI century the same cloistered life as the founders, 4 centuries ago. – The Church of San Jerónimo , on a hill aside to Prado museum where the Prince of Asturias, from Felipe II till Isabel II , oath as heir to the crown of Spain. – The Plaza Mayor: Most beautiful Renaissance square of Spain. It has a surface of 120 x 85 meters. Do not miss neither its 10 diagonal arches nor the soft undulation of its grey slate roof and needle towers. Plaza Mayor was the Centre of Life in Madrid of the Austrians Kings. Many things happened in Plaza Mayor: Here were held Trials of the Spanish Holy Inquisition, Processions, Carnivals, Royal Weddings and Bullfights. In the centre of the Plaza Mayor, the statue of King Felipe III. He was a very devoted king who inaugurated many convents and churches in Madrid but had little courage to govern. Felipe III initiated the historical decline of Spain. This king should not miss on good walking tours in Madrid. – Palace of Santa Cruz: Near of the Plaza Mayor, it was Madrid’s first prison. Currently, this impressive sample of Austrian architecture lodges Spains Ministry of Foreign Affairs headquarter. – Retiro park: It was inaugurated by King Philip IV as a royal hunting preserve and auditorium for magnificent theatrical performances. – Calle de los Cuchilleros : Attached to the Plaza Mayor, caves and inns on this winding street are kept unscathed . Great spot to taste famous Tortilla Española con Vino Manchego while a flamenco group entertains you. – Basilica de San Francisco el Grande: One of the favourite churches of Madrid people(and included inside the general walking tours in Madrid), for its grandiose architecture, sculptures and frescoes. Its imposing vault of 33 meters and the 6 side chapels filled with frescoes created by talented Spanish Romantic painters made visitors breathless. On its interior, surrounding the entire basement, are 12 majestic three meters, in Carrara marble, big sculptures of Jesus apostles. At the apse stand out four huge polychrome wood sculptures of the Evangelists. This living museum, centre of religious life in Madrid, is an absolute must for any visitor to the capital of Spain. – La Puerta de Alcalá: Its author was Francesco Sabatini, architect of the Royal Palace. It’s another symbol of Madrid. It has 3 round Renaissance and 2 rectangular arches. The King Mayor of Madrid, Carlos III, ordered its construction to commemorate his arrival to Madrid. – La Fuente de Cibeles : Another emblematic symbol of Madrid. Created by sculptor and architect Ventura Rodríguez. The 2 lions who pull the chariot of goddess Cibeles were Atalante and Hippomenes, 2 lovers who were surprised by Cibeles ”holding hands” at the altar of her temple. On our private tour of Prado Museum, ‘Emotions and Passions’ you will enjoy breathaking Masterpieces of enormous expressive power that capture the intense love affairs, jealousy and revenges that have accompanied human condition since its creation. – The Prado Museum: This is the most beautiful neoclassical building you’ll see during several walking tours in Madrid. It was finished in 1785 by architect Juan de Villanueva to become the future Museum of Science and Natural History. However, Napoleon chose it to be the stable for his horses during his occupation of Madrid. In 1819, the Bourbon King Ferdinand VII inaugurated here Prado Museum. The word Prado alludes to the vast esplanade in which the building was erected, just in the middle of nowhere. Which are some of the many gardens you can enjoy during the walking tours in Madrid? Retiro Park is an unique green area due to its splendid royal past and varied artistic and cultural spots. Squirrels delight the walkers, in the ponds children feed voracious carp fishes while paddlers row in the lake and tourists shoot photos of impressive King Alfonso XII monument. Aside the lake, street performers and fortune-tellers entertain pedestrians. Hurry up and join the vibrant life of Madrid’s most popular park. The Retiro is waiting for you. This park is almost nine miles long. Spend a morning walking it through; you won’t regret it. Casa de Campo station ( Line 5) or Lago station ( Line 10) are excellent subway connections. From the Royal Palace terrace or Parque del Oeste esplanade you will see the 2.5 km funicular railway that connects Madrid and the Casa de Campo. The Zoo and the Parque de Atracciones at the Casa de Campo have many visitors. Also runners and cyclists are seeing very often taken advantage of vast areas specially designed for them. Those are not walking tours in Madrid at all, but they are available too. However, the Caves of the Garden of Felipe II, an unique architectural ensemble from the 16th century – and the only vestige of a Renaissance garden in Madrid – is, for all lovers of parks and archaeology treasures, undoubtedly, Casa de Campo main attraction. This garden hides behind the wall of Lazaro Galdiano museum, at the end of populous Serrano Street. Don Jose Lazaro Galdiano was a very wealthy Spanish collector and intellectual of the early 20th century who edited La España Moderna, the country first cultural magazine. The gardens were personally designed by Lazaro Galdiano to provide a pleasant environment to his walks with his beloved wife, Dona Paula Florido, Argentina’s wealthiest lady. Located in Chamberí district of Madrid, we have here another Garden personally designed by Joaquin Sorolla, famous Spanish impressionist painter. In this garden, accompanied by Clotilde, his beloved wife, Sorolla found the peace he needed after those strenuous journeys he spent away from home, working on the monumental commission ‘Visions of Spain’, entrusted to him by his friend, millionaire Archer M. Huntington. This garden is a perfect scenery for you to relax. Visit Sorolla garden, sit on a bench and imagine that you’re in the same place where Sorolla spent painting the last years of his life. Generally, walking tours in Madrid only about Gardens, It’s an original idea. The Sabatini Garden is a wonderful setting for enjoying summer concerts in Madrid. Due to its proximity to the Royal Palace it’s one of the most popular gardens for spring and summer visitors. Its summer terrace offers beautiful views to the Royal Palace and refreshing cocktails and highballs. This cute garden, adjacent to the Museum of Romanticism, is an unavoidable gem and deserves to be featured in your walk in Madrid itinerary. Café del Jardín is the ideal place to end a tour of this museum. Faithful to romantic emotions, this charming garden, which has regained its original character in 2018, is a small paradise that inspires various feelings to visitors and, among them -why not-, the beautiful feeling of falling in love. Inaugurated in 1992 by one of Madrid’s best mayors, this unique and immense park replaced a degraded olive grove on the outskirts of the city, near the airport. Juan Carlos park has an accentuated architectural space design. The area offers pleasant botanical trails around ponds and a large estuary. 19 gigantic sculptures made by artists from all over the world adorn the 220 hectares of green surface… Our Authentic Madrid Private Tour combines the Royal Palace of El Pardo with a relaxing walk through this monumental park and its most significant historical attraction: the Garden of the 3 Cultures. Don’t miss it! We are keeping shot only with these recommendations. However, the only way to discover our treasures in a walking tour in Madrid it’s coming and living the life and activity. Visit our website for more. We have which you need.